Back in 2010, Pepsi dropped out of the Super Bowl, the marquee marketing event Pepsi has sponsored for years, before and since. The game plan was to shift dollars into digital marketing, particularly social media. The experiment proved disappointing, and they quickly returned to the Super Bowl the following year. 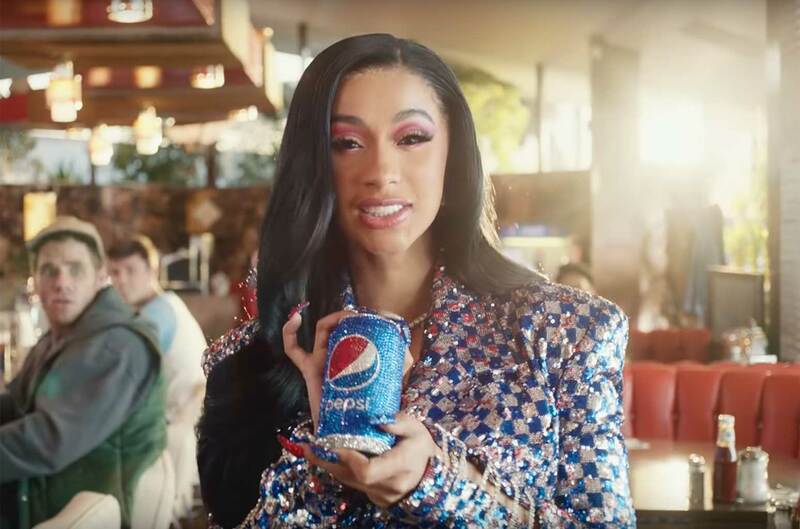 In 2019 Pepsi sponsored the half-time show for the seventh time in a row, taking advantage of the buzz that the Super Bowl often generates for advertisers. 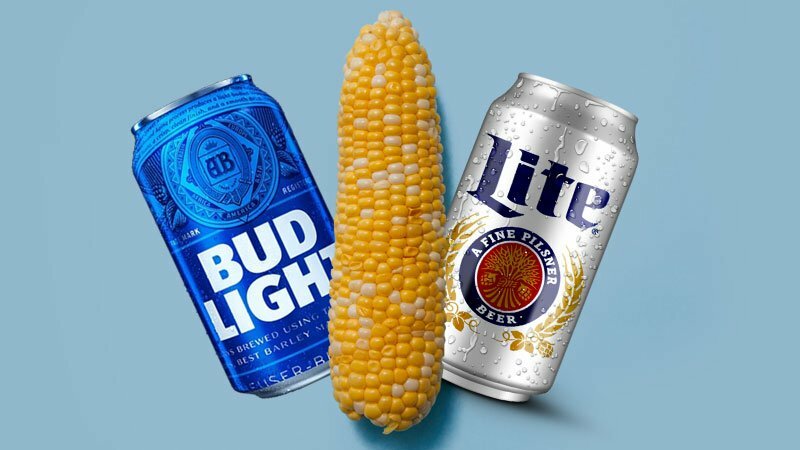 Consumer conversation data from Engagement Labs helps to show why that 2010 digital experiment was unlikely to succeed, and why brands like Pepsi are no longer betting the farm on social media. The beverage category, in fact, is poorly represented in digital conversations, making it difficult for beverage brands in general to rely on an online social media strategy. In the real world, beverages get an enormous share of consumer conversations—12.8% of all face-to-face and voice-to-voice discussion about brands is about beverage brands, second only to retail and apparel brands, which earn 18.0% of the offline discussion. This makes sense because beverages, both alcoholic and non, are highly social. People very often enjoy beverages when together socially with others. 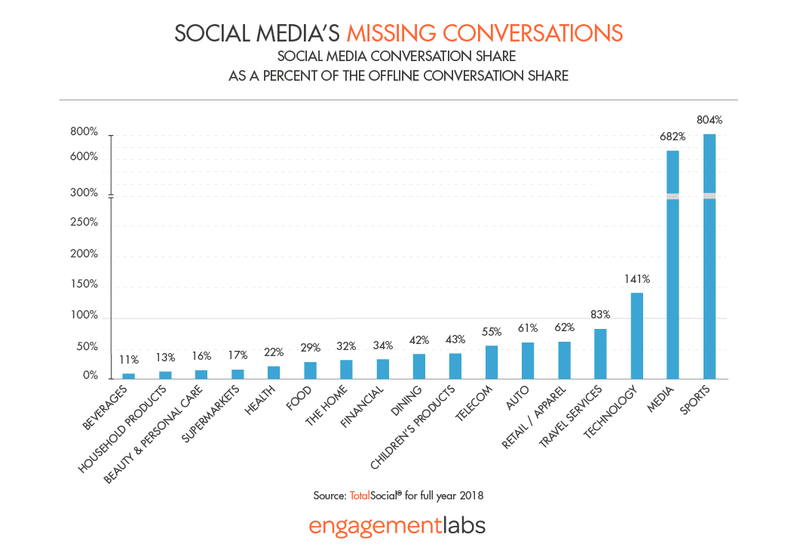 But in social media, beverage brands are merely 1.8% of all conversations. The share of conversation online is just 11% of the share they get offline, the worst ratio of any category measured. Other categories with big shortfalls in social media are household and beauty products, supermarkets, health, and food, all categories that receive in social media less than 30% of the attention they earn in face-to-face conversations. One key reason for this is that three categories—technology, media, and sports, get massively larger shares of social media discussions as they do offline conversations. Sports—teams, leagues, etc.—get eight times as many conversations online as offline. Media brands—TV shows, networks, movies, etc.—get seven times the share online as offline. And technology brands—such as Apple, Samsung, and Sony—get 41% greater share of conversations online compared to offline. The surplus of sports and media category conversations make sense because social media, after all, are media, and increasingly platforms like Facebook and Twitter have become distribution systems for news and entertainment. Every other category, including retail, travel, finance, telecom, and restaurants, get a smaller share of conversations online compared to offline. While people love widely sharing family celebrations and cute household pet videos, consumers are less motivated to share personal finances, favorite condiments, and preferred supermarkets—the ordinary stuff of our lives as consumers. These are conversations more likely to occur face to face or voice to voice. Research by Engagement Labs recently published in the MIT Sloan Management Review shows that both online and offline conversations are important drivers of purchase. On average, 19% of all purchases are driven by conversations, including 10% driven by offline conversations and 9% by online ones. For beverages, the total impact is higher, 22% driven by conversations of both kinds, but the ratio is 13% offline to 9% online. Despite big volume shortfalls in social media, online discussions still an important role in driving purchases even for categories like beverages where the share of online conversation is tiny. The reason is that social media give conversations can be seen by hundreds and sometimes thousands of consumers, whereas offline conversations are usually just among a few close friends or family members. 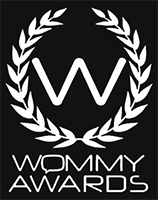 Thus, brands in every category must have a TotalSocial® strategy that includes both offline and digital brand engagement. But too many brands are focusing exclusively on social media to spur social engagement and recommendations for their brands, and that’s a one-sided strategy unlikely to succeed, particularly for grocery staples that are more often talked about over a kitchen table than on Facebook or Twitter. 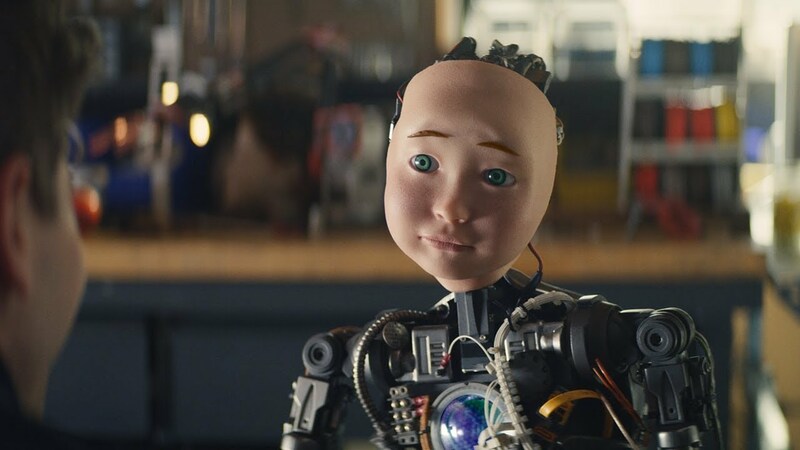 Academic research has found that offline conversations about brands are principally about “emotional sharing,” and focus on everyday products and services. 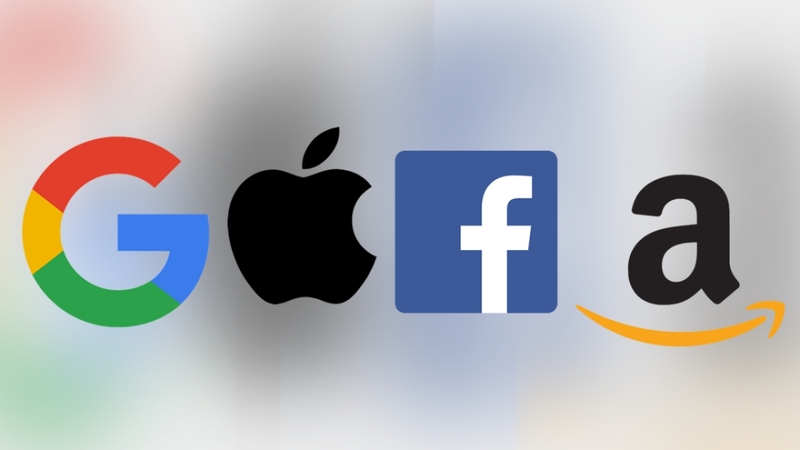 By comparison, social media discussions tend to be about “social signaling,” or wanting to demonstrate one’s superior knowledge and expertise about exciting new products or services. For marketers of packaged goods, that means it’s very important to be stimulating and listening to the conversations that happen in the relative privacy of our homes, automobiles, and workplaces. Every marketer should be thinking beyond social media, but that’s especially true in the categories for which social media discussions fall short of the share that occurs offline. Our advice to marketers: Mind the gap between online and offline conversations.